(CNN) - President Donald Trump asked Sen. Pat Toomey, a Pennsylvania Republican who's worked on a bill to strengthen background checks for gun purchases, whether he left a proposal to raise the gun purchasing age to 21 out of his measure because senators are "afraid of the NRA." In an exchange during a meeting of a bipartisan group of senators at the White House, Trump asked Sens. Joe Manchin of West Virginia and Toomey if their background check bill they authored in the aftermath of a shooting at Sandy Hook Elementary School in 2012 included a provision that would have raised the age at which individuals could purchase rifles from 18 to 21. Toomey said it did not. "You know why? Because you're afraid of the NRA," Trump said. The Manchin-Toomey bill is different from the more limited "Fix NICS" bill, from Sens. John Cornyn, a Texas Republican and the second ranking GOP member in the chamber, and Chris Murphy, a Connecticut Democrat, which offers financial incentives for state and local governments to report information to the National Instant Criminal Background Check System. Trump reiterated multiple times Wednesday that he wanted to see a "comprehensive" approach on guns. The comments undercut Republican congressional leaders who have argued that the key on any legislation was starting with a bill that had broader bipartisan support like the narrow Fix NICs bill. Throughout the meeting, Trump encouraged members to present their ideas. Sometimes after an idea was presented Trump would look at colleagues and ask if it could be added to the base bill. He called for "one, great piece of legislation." Toomey said after the meeting that he didn't think Trump's comments were aimed at him personally. "I think he was referring to members of Congress generally," Toomey said. Toomey said that he hasn't received any money from the NRA since 2010. "If there's a Republican who has demonstrated he's not afraid of the NRA, that would be me," he said. Trump's comments on the NRA are notable because Toomey's expanded background check bill from 2013 was opposed by the National Rifle Association. In a statement in April 2013, the NRA said the Manchin-Toomey bill, which would have expanded background checks at gun shows and over internet sales, would "not prevent the next shooting" and would "not solve violent crime." "While the overwhelming rejection of President Obama and Mayor Bloomberg's "universal" background check agenda is a positive development, we have a broken mental health system that is not going to be fixed with more background checks at gun shows. The sad truth is that no background check would have prevented the tragedies in Newtown, Aurora or Tucson," the NRA's statement said. "We need a serious and meaningful solution that addresses crime in cities like Chicago, addresses mental health deficiencies, while at the same time protecting the rights of those of us who are not a danger to anyone." A spokesman for Toomey said that the senator has demonstrated that he's not afraid of the gun lobby. 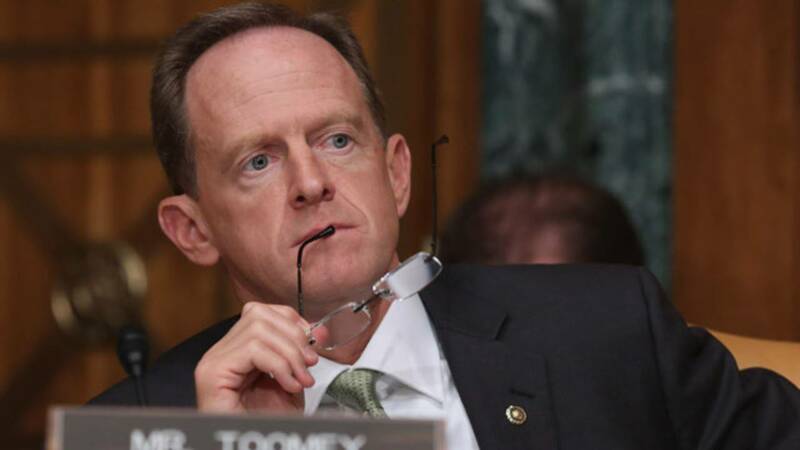 "Despite the aggressive opposition of the NRA, Senator Toomey never wavered in his commitment to this legislation," Toomey press secretary Steve Kelly said in a statement. "The NRA downgraded Senator Toomey's rating and refused to back him for re-election." At Wednesday's meeting, Trump argued that it should be "so easy" to get 60 Senate votes on common-sense reforms -- though it's unclear exactly which ones. Murphy sought to give him a reality check: "I think you underestimate the power of the gun lobby." Trump retorted that while "they have great power over you people, they have less power over me." Trump argued that the NRA is "well-meaning" and said he believes "they're there" as far as supporting more reforms -- a view that has not been backed up by any of the NRA's public statements in the wake of the Parkland shooting. "Some of you people are petrified of the NRA. You can't be petrified. You can't be petrified," Trump said. "The National Rifle Association has always supported efforts to secure our schools and keep firearms out of the hands of those who are a danger to themselves or others, whether they are criminals or mentally ill," Jennifer Baker, of the NRA's Institute for Legislative Action, the organization's lobbying arm, said Wednesday in a statement provided to CNN. "This can be accomplished without shifting the focus, blame, or burden onto safe, law-abiding gun owners. Doing everything we can as a nation to address the problem of dangerous people committing heinous acts is not inconsistent with the Second Amendment."